Tooth loss is very common among adults, especially as we get older. Instead of dealing with the discomfort and annoyance of dentures, many people are turning to All on 4 dental implants. All on 4 dental implants are an innovative method for replacing your teeth. But what is an implant? An implant is a small metal (often times titanium) screw that is screwed into the bone of your jaw. This implant replaces the root(s) of missing teeth. A small surgery is necessary to insert the dental implants. After the dental implant is correctly placed, a crown is connected. The end product gives you an extremely realistic looking and fully functional tooth. All on 4 dental implants are surgically placed permanent implants secured by, you guessed it, 4 implants (per jaw). 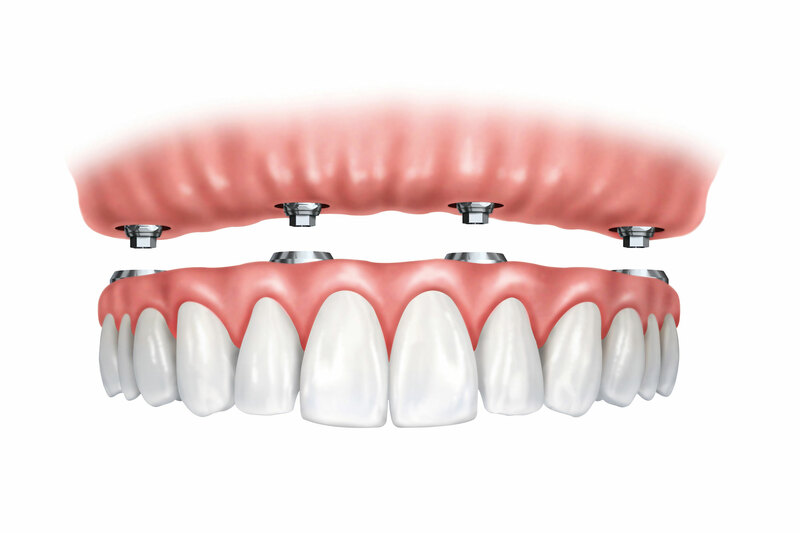 All on 4 dental implants are made of titanium and have the unique ability to fuse with your jaw. There are many benefits of these special dental implants. In addition to improving your oral health, all on 4 dental implants can greatly increase your self-confidence by acting like your real teeth. Combining South Gables Dental’s expertise with this innovative all-on-four procedure, you can have a natural and beautiful new smile. Your new smile will look and feel great but you should know that it takes dental implants some time to heal and connect with the bone in your jaw. After your dental implants heal and connect with your jawbone, we’ll schedule an appointment at your convenience to replace these temporary teeth with permanent, beautiful teeth built just for your mouth. Call us or schedule a dental appointment in our Coral Gables office to Learn how we can transform your smile today!